Believing that you’re capable, that you can figure things out, and that you’re WORTHY, are everything when it comes to living a high performance lifestyle. This is a MUST WATCH episode about the 3 beliefs that are necessary for achieving long term success. Once you’re in transition and you’re dealing with a challenge, and you’re really frustrated, those are the times personal development really matters. Forgive me if some of these phrases might sound cliche. It’s just how people talk, and it is fundamental to you succeeding. Let’s talk about the bubble of you, and the three beliefs that you have to have to achieve long-term success, based on my interviews and experience. Belief #1: I am being or trying to be congruent with the best of who I know I can be. Or were you just going through the emotions of the day? Were you just reacting throughout the day? Were you actually comparing yourself to other people and letting it get you down? Were you aware of what makes you unique and living into that uniqueness? Were you living into your values and attempting consistently and conscientiously to be the best of who you are? Or, were you going through the motions this last week? What I found with High Performers is that they’re more consistently testing their congruence against the standard of their best self, against the standard of what we call their highest self. It’s easy not to do that, especially when you’re good. Especially when you’re talented. Especially when things are going well, you can just get up and go through the day and do a good job. But what happens over a series of weeks, is one day you don’t feel like you’re really on your path when you’re just going through the motions. One day you wake up and feel like you’re in a funk and don’t even know why. You don’t know why things don’t pop for you. You don’t feel like there’s momentum in your life. You want to talk about real misery in your life? Be out of congruence. If you’re a person whose identity says, “I am a healthy, positive, caring, goal-oriented person,” and you just know that’s who you are, but you’re not congruent with that, that’s where misery comes in. If you identify the best of who you are, you know you’re a healthy person. But for five nights in a row you got drunk, five nights in a row you ate crappy food, five days in a row you ate too much, you know at the end of the week that does affect your psyche. Why does this matter? Because when you don’t have that belief that you are being congruent with the best of who you are, then self-hatred comes in. Negative self-talk like, “I’m not good enough, I’m terrible,” comes in. Attempting to be congruent with the best of who you are does not necessarily mean that everyday you are the absolute best of who you are and everything was perfect and you were totally congruent. You might say, “I had a great week, Brendon.” It’s not about if you had a great week. People see you and are impressed by your achievements, they’re impressed by the external reality of your success. You can have a lot of momentum in your life, but if physiologically—even if it’s unconscious—you know you’re not truly living in accordance with the best of who you can be, it starts grating at you. Over a period of time, when you’re not congruent, you’re grating at your confidence unconsciously. You might not even know it. There were times when I wasn’t my best each day. I didn’t try to show who I was. Each day I wasn’t being authentic. What can happen to you is suddenly, over a period of time, that lack of congruence just bores a hole right in your confidence and you don’t even know why. You just wake up one day not feeling yourself. Then it becomes this big challenge because maybe you haven’t had training like this on congruence and now it feels like this big existential dilemma. You may think, “Oh my god, something’s wrong with the universe, something’s wrong with me,” and the reality is you just weren’t trying often enough to be congruent with the best of who you can be. Belief #2: I am capable of achieving the future that I want. Thinking, “I am capable” is everything. You don’t have to believe you have all the competencies that are necessary to succeed. You have to believe that you are CAPABLE of getting them. There’s so many things that I know, right now today, that I am incapable of. I am incapable of many things ’cause I don’t have the skill set yet, but I believe that I am capable. You give me enough time, energy, resources, mentorship, hard work, and days at something, and I will figure it out, I will develop that skill, I will achieve. This is how High Performers think. It’s so clear that under performers get stuck stewing on what they are not capable of, so they stop that forward momentum. They go, “I’m not good at that,” so they stop. “I never learned to do that,” so they stop. The research on mindset shows High Performers have a growth mindset and under performers tend to have a fixed mindset. That fixed mindset means they fix on their identity, who they believe they are and what they’re capable of. They think their knowledge, skills, talents, and abilities are fixed. They were born that way and are stuck that way or that there’s a top to their potential. High Performers have that growth mindset where they really believe, “I’m capable of becoming more. I’m capable of figuring it out. I am capable of busting through. I am capable of getting the knowledge, skills, and abilities that are necessary for me to succeed.” That is a motivating driver for them. Here’s the test: if you have been lacking confidence or motivation to go for those bigger goals, somewhere in your psychology, you do not believe that you are capable. Not believing that you are capable is why you stopped. Even if you have all the reasons in the world to be confident—people like you, you’ve achieved things in the past, you’re a good person, you believe in your worth. Even if you have all that, but don’t believe you’re capable of breaking through or getting to that next level of skill, you’ll stop. Capability: to get it, you only need a few things. The belief of capability is tied to momentum. You have to take those first couple of steps. The first thing you need if you want to feel more capable is to make sure you are very clear on the map, on your course of action. You have to know step one, two and three, and you have to get started. What we really need to do is just start working on step one, two and three. Belief #3: I am worthy and deserving of having extraordinary success. Most people who live a little below their potential believe, “I am worthy or deserving of survival.” It literally stops at that. Their belief and their envisioning for what their life is worth and who they are is low. Standards seem to be low. Most people’s standard in their worth is survival-related. They think, “I deserve a good husband,” and it stops there. Thinking, “I’m worthy of good” is sometimes why you only ever got good. And if your belief is just getting good things, then good things is all you get. 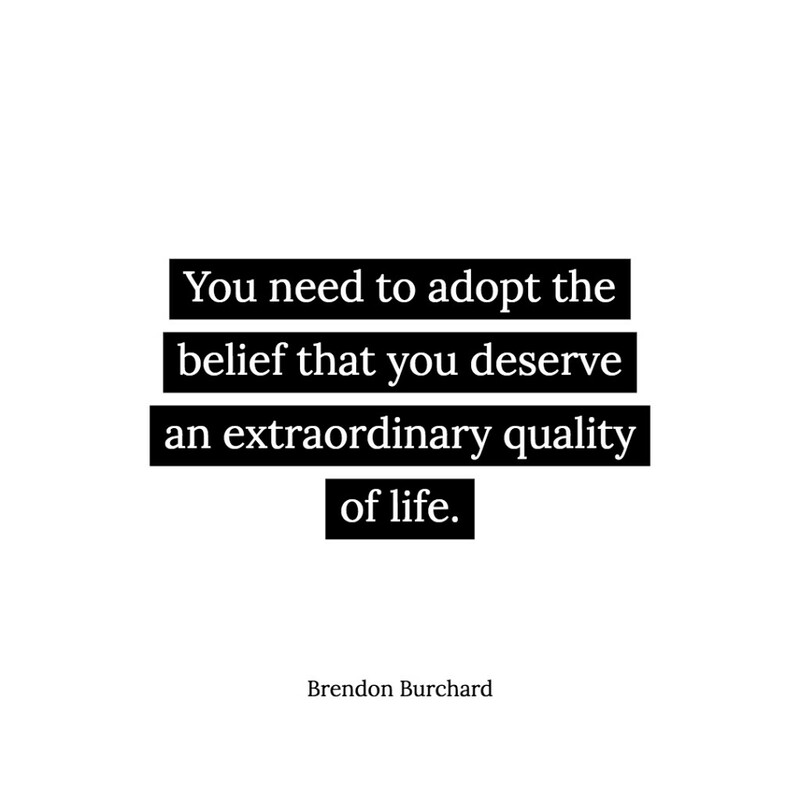 You need to adopt the belief that you deserve an extraordinary quality of life and do whatever it takes to achieve that. If you have to repeat that motto to yourself over and over again, do it. Look at the subtitle of this book (High Performance Habits), I don’t know if you guys noticed, but it says: How Extraordinary People Became That Way. Not how good people, not how great people, but how extraordinary people became that way. The reason that I put that word down is because so many of the 300 incredible people I interviewed for this used that word. They didn’t want good. They didn’t think they just deserved good, they thought they deserved something special. They thought they deserved and were worthy of that magical part of life where things have vibrancy and zest and pop. Where the adverbs and the adjectives had color and richness that were so different than what the regular mundane person wants who just has gray walls built around them of belief. Where it’s all just enough or always just great. High performers don’t feel guilt tied to their goals, because they believe that they are worthy of achieving or having those things. It doesn’t mean they always believe, “I deserve it,” because sometimes they’re not doing the work and it’s hard to believe you deserve something if you’re not doing the work. You can feel worthy of it because you’re a child of God, because you have been a good person, a trustworthy person, and a giving person; because you want good things for other people and you want good things for yourself, but you also know that makes you worthy because you care. The fact that you’re here alone, makes you worthy of the next level. The work will make you deserving, the belief will make you feel worthy. 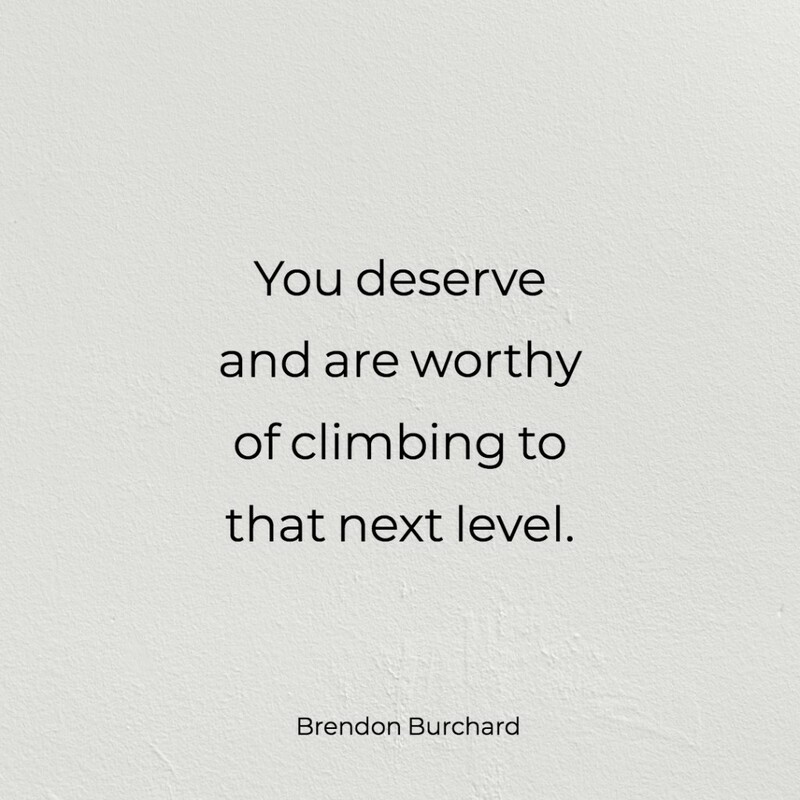 You deserve and are worthy of climbing that next level. If you don’t tell yourself that, it’s easy to sit back, take what you get, and feel grateful for it. I know a lot of people who are deeply grateful for life, but because they don’t feel worthy, they’re broke. How’s that for a mind screw? They’re grateful. They’re practicing what all these books say: be grateful, live a grateful life, life is precious. I know a lot of grateful people who are miserable because they don’t believe that they are also worthy of more. They’re grateful but they’ve settled for a crappy marriage. They’re grateful but they’ve settled for being in bad shape. They’re grateful but they’ve settled for a job that’s beneath them. If you don’t have worth, you can have all the gratitude in the world and still be emotionally broke. That’s the challenge that most people don’t see. That’s why a lot of the self-help that offers to just be happy and grateful is criticized by practitioners like myself. I know a lot of grateful people who can’t break through. 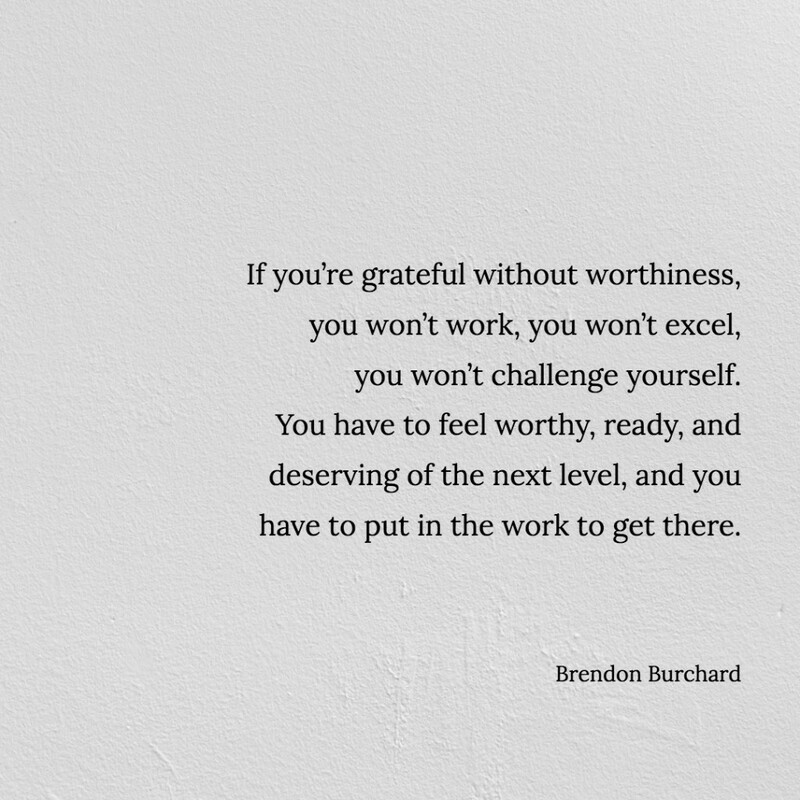 If you’re grateful without worthiness, you won’t work, you won’t excel, you won’t challenge yourself. You have to feel worthy, ready, and deserving of the next level and you have to put in the work to get there. I’m just sharing what High Performers shared. It is the distinction between High Performers and under performers. 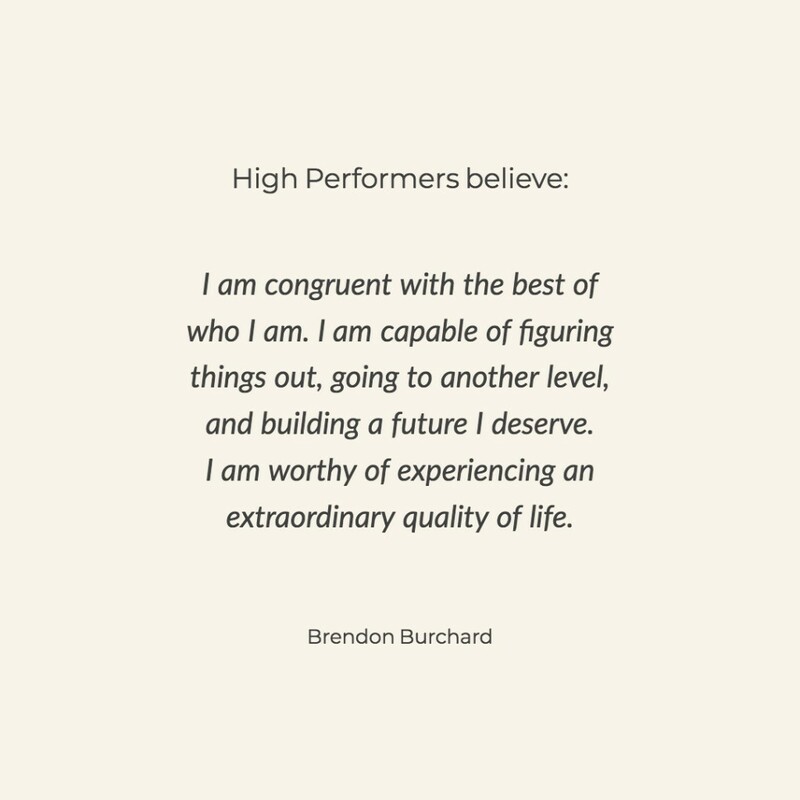 This is what High Performers believe: I am congruent and attempting to be congruent with the best of who I am. I am capable of figuring things out, going to another level, and building a future I deserve. I am worthy of experiencing an extraordinary quality of life.